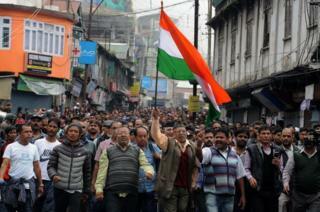 Thousands are protesting in Darjeeling, India, after separatist unrest broke out in the tea-producing region. On Sunday protesters marched with the coffins of two men they said died in clashes with India's security forces, waving flags and calling for peace. Around 50 people have been wounded in riots and arson attacks that began more than a week ago. Home Minister Rajnath Singh has appealed for calm, urging protesters and the state government to hold talks. Tensions first escalated when police raided the homes and offices of Gorkha Janmukti Morcha (GJM) members, who want a state for ethnic Gorkhas within West Bengal. The government had also angered the Gorkhas - who speak Nepali - by announcing plans to make the Bengali language mandatory in state schools. As relations deteriorated, the authorities sent troops and riot police in to patrol the famous tea resort. Police said one man died and 35 police officers were hurt in the violence on Saturday. West Bengal director general of police Anuj Sharma said the man appeared to have been shot, but police have denied using live ammunition. They say they used tear gas and baton charges after protesters torched cars and attacked the security forces with knives. But supporters of the GJM insist three of their comrades were shot dead by police. They say one of the bodies remains in a local hospital, awaiting a post mortem. Reports on Sunday suggested mobile internet access has been blocked in riot-hit areas of Darjeeling. Thousands of visitors, most of them Indian, have fled the picturesque area since the clashes began at the height of tourist season. The GJM has ruled out holding talks with the state authorities, saying it will only negotiate with India's central government.